The Jeppesen CR Circular Computers offer solid construction and proven performance. Whether you're solving wind triangles, polar grid navigation or pressure pattern flying, CR Computers prove their value and versatility every day. Useful in high and low speed problems. They automatically compensate for temperature rise and compressibility factors. Vinyl carrying case are included with each CR-3. 6" Diameter. Review: If I had seen this prior to purchase, I would have gotten the one smaller in size, but, it's a great unit. Be even better with a good instruction book. Review: I like the design of the Jepp CR-2 that I have, but it is too small to read easily. The CR-3 is large enough that it is much easier to read. This computer has more features than the E-6B, and the circular wind-drift calculator is a nice method that takes less turning and sliding of wheels. Review: I learned flight planing with the old Jep Avstar electronic E6-B in Embry-Riddle back in the '80's. When I learned to use the CR Wheel, the Avstar was thrown in to the back of the desk draw and never used again. In my opinion - I don't know why the E6-B was never retired when the CR was introduced... It factors in Compressibility and Ram Rise - which other computers don't - electronic or otherwise, and it's more portable. The 'Wind Side' is just plain stupid-easy. It's nothing more than a 360 cross wind correction chart. Review: The CR-3 has all the functionality you need but the Black print and Gray background make the wiz wheel difficult to read in anything but good lighting conditions. Review: CFII and have not had a chance to use it to the full extent. It needs to inclulde the work book to, that I picked up, to really make it useful. Worth the money and time to learn to use it. I have passed it on to my students for their imformation. Best chunk of plastic you'll ever buy! Review: Nothing but good to say. Easy to use when your bouncing around, easy to read, and NO BATTERIES!! Q: Is the CR-3 made of metal or plastic? A: This is a plastic CR-3. Q: I have an old CR-1. How does it compare with the current CR's, and where can I find instructions on how to use it? Thank You. All of the CR computers are basically the same, they are just different sizes and materials (i.e. plastic, metal, etc.). We have the CR Computer Manual/Workbook that will provide instructions. Q: Do you have this computer instructions in other languages? Q: Do you have a big CR computer for demonstrating in class for students? A: We do not have any larger instruction-style flight computers. Q: how can i download the cr3 instruction manual to use it. A: The Jeppesen CR Flight Computer instructions are available for viewing online on Jeppesen's website. A: CR stands for Counter-Rotating. Q: The original computer I was inquiring about is a 4 inch diameter. Do you have a CR style smaller than the CR-3 which I believe is 6 inches. The smaller size fits in my shirt pocket. 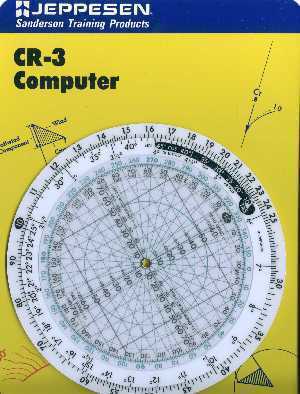 A: Jeppesen also makes a CR-5 that has a 3.75" diameter and a CR-2 with a 4.25" diameter.